Z-Meter DX4090 is the most balanced device for thermoelectric coolers express analysis. It measures directly three TEC key parameters (ACR, Figure-of-Merit and Time Constant) of separate and integrated thermoelectric coolers. The device has two measurement interfaces - internal chamber (works as a passive thermostat) with connectors and external interface with clips. DX4090 has built-in temperature sensor for accurate TEC ACR calculations and build-in function of TEC polarity check. DX4090 is recommended for express quality control of small and mid-size TEC batches, R&D analysis and TEC integrating/assembly process optimization. By default Z-Meter is optimized for measuring process of TECs with terminal wires or mounted on a header with pins. 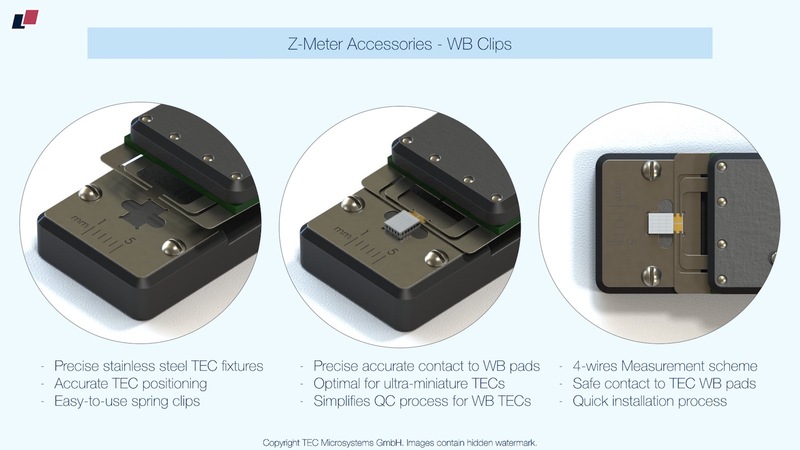 In case of TECs with WB pads there is a special solution for Z-Meters - WB clips. 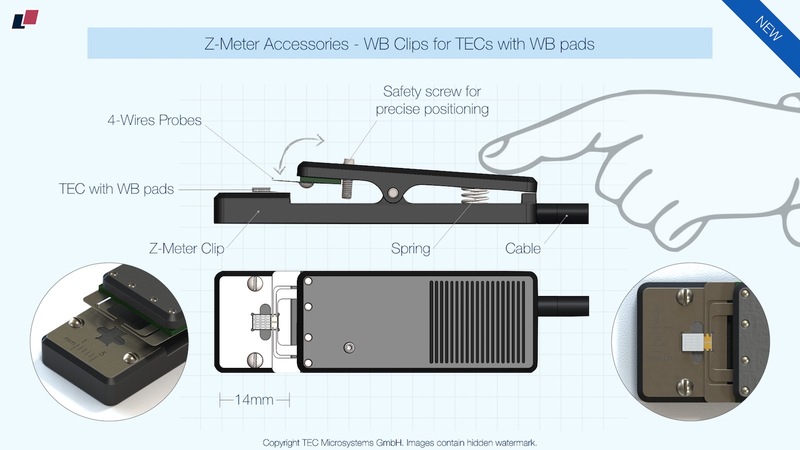 Z-Meter WB Clip is an optional accessory with stainless steel fixtures, manufactured by request for a specific TEC size. 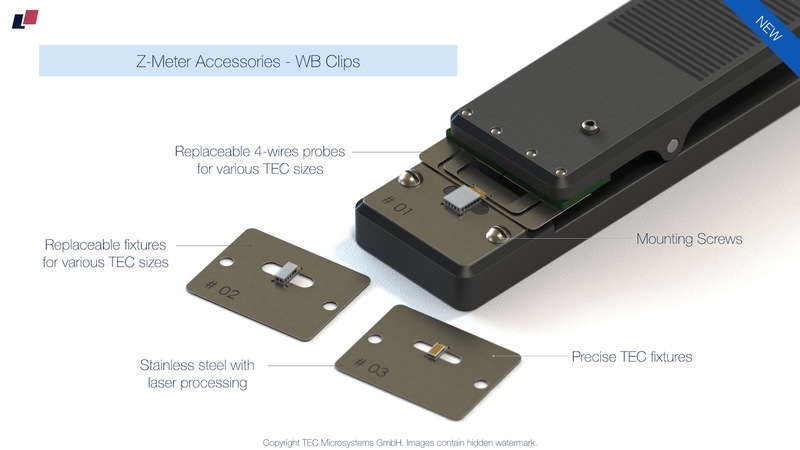 The compact instrument with spring clip fixation has 4-wires measuring method probes, that don't damage TEC WB pads during measuring process. 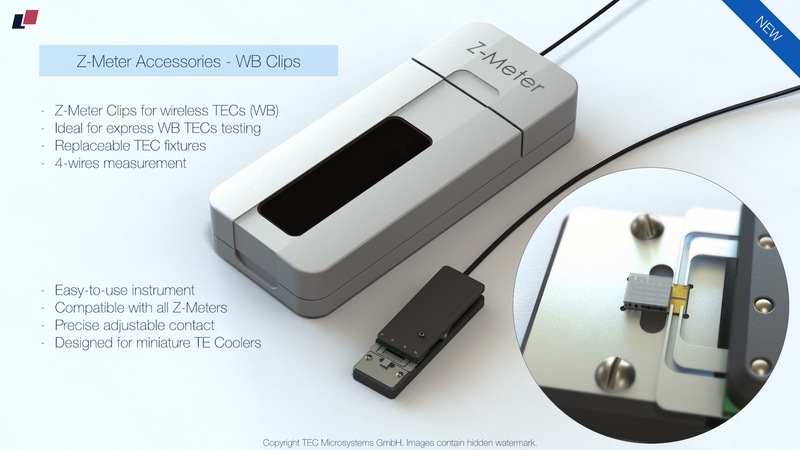 The clip has a terminal connector compatible with all Z-Meter versions. 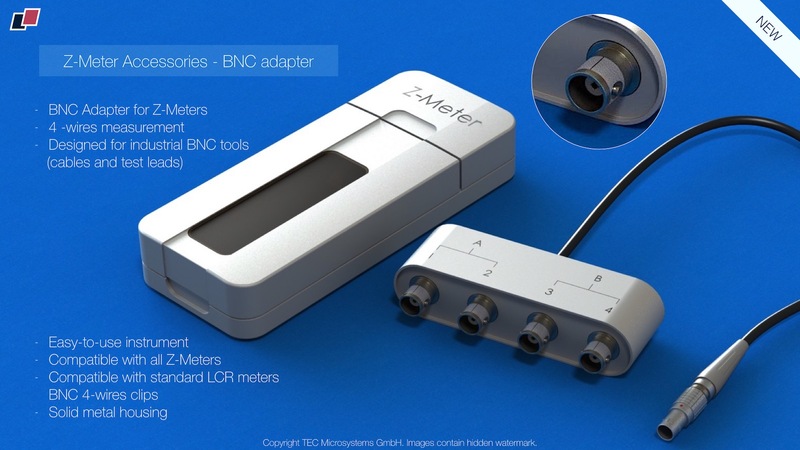 Z-Meter can be used also with standard laboratory measurement equipment like 4-wires BNC Kelvin clips or similar tools with BNC connector. For such cases TEC Microsystems provides BNC adapter, that allows to work standard BNC cable sets. 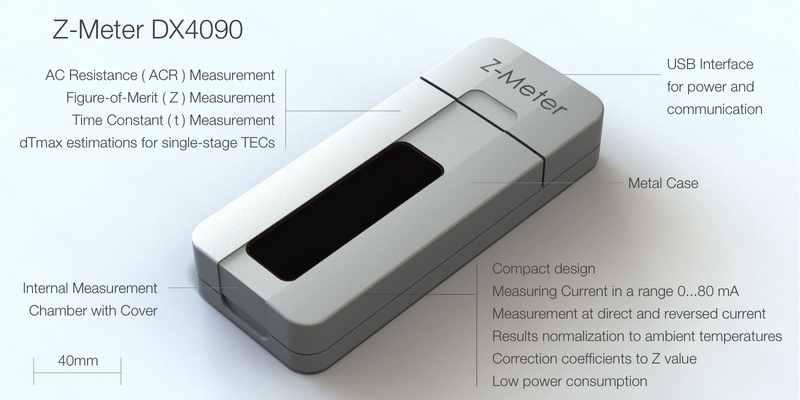 Z-Meter BNC adapter is compatible with all Z-Meter versions. DX4085 Z-Meter Tester. Pocket-size device in USB stick form-factor with constant PC connection required. DX4095 has external clips terminal connection for TECs only. Recommended for small-size batch QC measurements and occasional TEC testing. DX4190 10-pos Z-Meter complex. 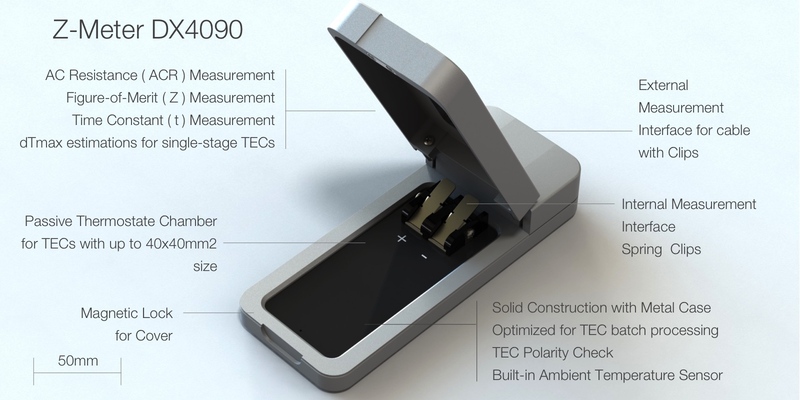 Allows simultaneous measurement process for 10x TECs at once. Ideal for large batches QC processing, TEC manufacturers and volume consumers. Table-top device with constant PC connection required. DX4095 Peltier Z-Meter Mini. Pocket size device as small as typical USB flash drive. 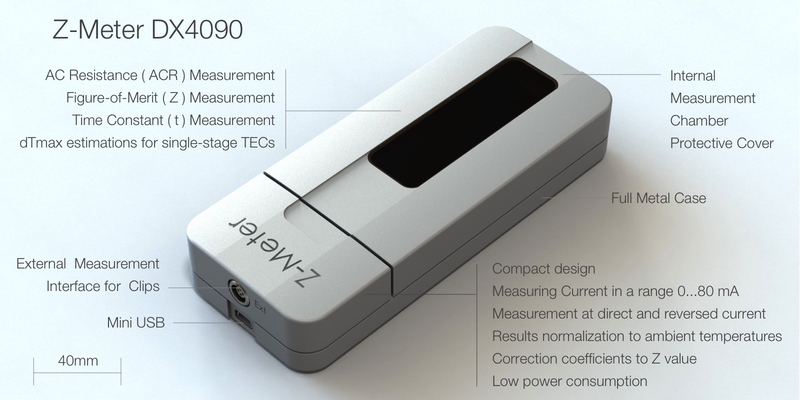 It has the same measuring functionality as standard Peltier Z-Meter and focused mainly on single thermoelectric coolers testing, R&D, trial batch check and laboratory usage. Z-Meter Mini uses external clips only. Optimal for occasional testing.